Sarah Parfitt is a Partners for Change Ambassador. She lives in the Berkshire village of Cookham and has linked Holy Trinity Primary School and many local people in an amazing relationship with the leprosy affected community of Gende Tesfa in eastern Ethiopia. You can read about her amazing work here. Thanks to everyone who came to our Ethiopian-themed Cookham Running Club Handicap on Saturday. Great fun! Congrats to all our winners – Helen Elphick, Josh Covus, Toby Dickinson and Ollie Leaf . The winners received a very special autograph from athlete and Great Ethiopian Run Ambassador Haile Gebrselassie. The fastest times of the day were recorded by Zoe Allanson (6.48) for the 1 mile and Jason Leaf (19.45) for the 5k. Thanks to your generosity, we have now raised enough money to fund another child at Gende Tesfa School Breakfast Club in Ethiopia. Hoorah! www.diaryofamarathonmum.wordpress.com. With special thanks to Lisa Fletcher, Gerald Cooper, James Dickinson, Stephen Cottrell and Rachel Sellman for their help organising the event. I can’t believe that our Ethiopian adventure will be drawing to a close in a few hours’ time. Tutu, Caroline and I are all aboard our Ethiopian Airlines flight home to Heathrow with a suitcase full of memories. We have had an action-packed week with an eclectic range of experiences and are returning to the UK sleep-deprived but energised and happy. We have been very blessed during this trip because our Ethiopian friends Tutu and Mulugeta have showed us around and given us a unique insight into what it means to be Ethiopian in 2010 (Ethiopia follows a different calendar and is 7 years behind us!). This was my third visit to Ethiopia, and with every visit I learn a little more about the culture here and grow more fond of this beautiful country and its proud people. My overriding memory of this trip will be of the wonderful, dignified people I have met. Whatever their socio-economic group, ethnicity or religion, everyone has opened up their homes for us and shown us true Ethiopian hospitality. One man who exemplifies this hospitality and oozes charisma is athlete and businessman Haile Gebrselassie, who has been a fantastic Ambassador for the Great Ethiopian Run. Yesterday all the international competitors and journalists were invited to his resort YaYa Village in the hills surrounding Addis. We were hugely impressed by the warmth of his welcome and Haile’s genuine ease chatting to people from all walks of life – taking time to dance with each of the tables. In a few hours’ time, life will return to normal. I will be doing the school run in Cookham again. I can’t wait to see my gorgeous three boys and our Cocker Spaniel Daisy. But wherever I go, the children at the Breakfast Club in Gende Tesfa will not be too far from my thoughts and I will continue trying to play my small part in helping to improve lives there. Friends often ask me how I became an Ambassador for PFC Ethiopia and why I feel compelled to keep supporting Gende Tesfa, which translates from Amharic into English as “Village of Hope”. I am not sure I can articulate this in words or my put my finger on it. But when I visited the Breakfast Club and met the children and parents, I was deeply moved. Connecting two very different villages – one in leafy Berkshire and the other in dusty Dire Dawa – has been a joy and a gift but I could not do it without the support of my family, friends and colleagues. Special thanks also to my husband Damian and my children Joshua and Jack. One final thank you to Tutu and Nancy for adding their special magic to our trip. Also a a gigantic thank you to my friend – photographer Caroline Field– who has captured so many beautiful moments in a way i could never do. I couldn’t think of nicer “partners in crime” or travel buddies. So there are just a few hours to go until the Great Ethiopian Run in Addis Ababa – the excitement is palpable and the bus is picking us up at 6am to take us to the start-line. There are going to be 42,000 runners in what Haile Gebrselassie described as one big carnival – we plan to dance after every kilometre! I don’t think we are going to get much sleep tonight. I interviewed Haile Gebrselassie yesterday and today we got to dance with him at the pasta party. What an extraordinary couple of days! The Great Ethiopian Run will be broadcast live on Ethiopian TV, so do look out for our team, which is called “Tutus For Change” because we are running with Tutu Melaku wearing tutus and we are all trying change lives in Ethiopia as Ambassadors for Partners For Change Ethiopia. If you can, please make a donation, however small. Thank you! The countdown to the Great Ethiopian Run begins…. What a difference a day makes! Yesterday we were in Eastern Ethiopia visiting Gende Tesfa, a community where nearly every family is affected by leprosy and poverty and today we attended the Great Ethiopian Run press conference in the opulent surroundings of the Hilton in Addis Ababa in the company of Haile Gebrselassie and lots of international visitors. It is a race I have always wanted to do, so I am thrilled to be here, especially as because of the State of Emergency in Ethiopia, we were unsure whether the race would go ahead until a couple of weeks ago, and some friends pulled out of coming to Addis. There was a funny moment on the way to the press conference today. My friend Caroline and I were travelling in a minibus with a Spanish journalist who was working for AFP and two Kenyan athletes. We asked them who was going to the win the Great Ethiopian Run on Sunday and they both said “me”! They then revealed that they both had a PB of around 28 minutes for a 10km, which gives them godly status in my eyes! I should add that Caroline, Tutu and I will be joining the fun runners and indulging in the carnival atmosphere which the race is renowned for. This evening I got to interview Ethiopian runner and icon Haile Gebrselassie, which was definitely one of the highlights of our trip if not my year!! I am fascinated not just by an athlete but a man who has achieved so much – 27 world records, two Olympic gold medals and four World Championships in 10,000 metre events and he has also just become President of the Ethiopian Athletics Federation. But Gebrselassie’s achievement don’t just end there – he is also a hugely successful businessman, he has four children and is an incredibly positive and helpful person. He even gave us a lift back to our hotel tonight. I can’t wait until the race on Sunday. It is going to be great to experience a race in Ethiopia – hopefully we will carried around the course on a wave of euphoria as we pound the streets of Addis. This year’s race motto is: “Live to tell”. Nothing unites people like sport and running…..
Another busy morning in Gende Tesfa. This morning we met the Women’s Business Group at the school, which JeCCDo overseas. There are currently fifteen women in the group and the charity has helped train them and has given them a loan so that they can start their own business. It costs around £100 to help each woman, and they run a variety of businesses, including selling injera, running a small shop, urban farming and hairdressing. Once their business is up and running, the women need to repay the loan within 2 years. Caroline and I chatted to the women and found out more about their lives. They said that running their own business had transformed their lives and empowered them. One mother of three, Alfiya, who runs her own injera business, had just slept under a piece of corrugated iron with her family before getting help from JeCCDo. Alfiya says she can now look after her children properly because she has a house and a toilet of which she is immensely proud. I presented each woman with a Maidenhead Business Girls’ t-shirt and they were absolutely thrilled. Thank you so much Amanda Ayres and Seema from Goyals for sponsoring this initiative. The women in Gende Tesfa would love to hear more about your businesses and link up with you in some way. On November 26th, Cookham Running Club will have a Ethiopia-themed handicap run, where people can come dressed in yellow, green, red and blue. All funds raised will be donated to Gende Tesfa School. So today Caroline and went for a run with some of the children and staff from the school. It was great fun and judging from today, there might be some future Olympic athletes there! Our last stop of the morning was to see a teenage boy called Matteus, who I met back in March 2015 when we went for a dusty 5km run with on the outskirts of Dire Dawa. It was a very memorable and serene run because Matteus is deaf and dumb. I went back to say hello with Matteus and to give him a small gift. This afternoon we flew back to Addis Ababa from Dire Dawa, ready for the next part of our adventure. It is very late here in Dire Dawa in Eastern Ethiopia, a city which tantalises the senses. My head is buzzing with thoughts about what has been an extraordinary day at Gende Tesfa School. I have felt a kaleidoscope of emotions. For 2 years, we have organised fundraising events in Cookham, and today I finally got to see how the money is improving the lives of more than 1000 children who attend the school. A real milestone in this very special UK- Ethiopia partnership. Our day started with a visit to the Breakfast Club. The kids were tucking into a plate of potatoes and vegetables and sugary tea. Thanks to Cookham’s fundraising efforts, some of the most vulnerable children at the school have a good breakfast every day. For many of them, it is the only meal they will have. The Breakfast team staff also help the children with health and hygiene and talk to them about any issues which might be worrying them. I found it profoundly moving to see the Breakfast Club. Before it existed, some of the most vulnerable children used to go through the entire school day without eating, and they sometimes passed out in the classroom. The headteacher Wendu Fekade said there are around 50 more vulnerable children at the school who are either orphans or come from extremely poor backgrounds, who would benefit tremendously from attending the Breakfast Club, but at present there is no funding for them. I felt the tears welling up in my eyes when I heard this. Sister Tigist, who is one of the JeCCDo team, then showed us the new sports ground which Cookham has funded. Some of the older children were playing football. When I visited Gende Tesfa School back in March 2015, there was nowhere for the children to play sport, so this was also great to see. My friend Caroline and I then delivered all the letters from Holy Trinity School in Cookham to the children in the different classes. The kids were so excited but rather nervous about opening the envelopes. The teachers said that the younger children had never received a letter before. When the children saw the letters and pencils, their faces lit up. We visited three classes, taught them some English, sang songs and wrote letters back to the children in Cookham. In the afternoon, we were invited to a meeting at the school, but when we arrived mid-afternoon, the parents of the children from the Breakfast Club had organised a surprise celebratory coffee-ceremony for us. It was very humbling and overwhelming, particularly as they have nothing and struggle to feed and clothe their kids. After several speeches, the coffee-ceremony began and we were presented with a big cake and two resplendent drias. There was so much joy in the room as the women danced, shouted and clapped to show their appreciation for all the fundraising in Cookham. It was a very special moment indeed. Moving forward, JeCCDo hopes that the parents of the children at the Breakfast Club will take part in one of their special training programmes, and start up their own businesses. .
After an early flight from Addis Ababa to Dire Dawa, Caroline and I headed off to Gende Tesfa School and were welcomed by the Scouts. All of the children, who were aged between 9 and 15, had just been given uniforms by our charity and the boys and girls looked really smart. Unlike the UK, you have to be selected to be a Scout in Ethiopia and normally it is for good behaviour or for excelling at school work. The Scouts learn citizenship skills and help run the urban garden at Gende Tesfa School and sell the produce to raise money for the poorer members of the community. They also visit the elderly and do jobs for them as well as helping with conservation projects. I presented the boys with badges from Cookham Cubs. It is the first badges they have ever had as the school can’t afford to buy “luxury items”, so they were particularly excited about the gift from the UK. In the afternoon, we met three women who are part of the Women’s Business Group and each run their own businesses – Saeda, Fatuma and Alfiya. I met Fatuma and her husband Mohammad back in March 2015, so it was lovely to catch up with them both. It was also so impressive to see what all three women had achieved for themselves and their families in very difficult circumstances. It is so great to be back in Gende Tesfa again…. A new Ethiopian adventure begins….. So, after much anticipation and planning, my friends, Caroline Field (photographer) and Tutu Melaku (owner of Tutu’s Ethiopian Table in Reading) and I have embarked on another Ethiopian adventure. We arrived here at 6am this morning, feeling sleep-deprived but happy. It was quite a logistical feat bringing all our luggage across to Ethiopia on the plane as we had lots of gifts, letters and pencils from the children at Holy Trinity School, more than 70 t-shirts and a very heavy wheelchair and some crutches, but we made it with thanks to our friends at Ethiopian Airlines. Hoorah! I am writing this to you from an internet cafe in the country’s dusty, vibrant capital, Addis Ababa. It is a haven of tranquility here, but outside there is lots of hustle and bustle and the crowds have gathered for a goat market. I had planned to promote our trip on Facebook and Twitter, but it has been banned because of the State of Emergency. The internet also keeps crashing, so this might be quite a short blog entry! With 40,000 participants, the Great Ethiopian Run is the biggest road race in Africa. Just to add to the adventure – Addis Ababa is also 2500m above sea level and the third highest capital in the world, so it will be the highest ever 10km we have run! Who knows, if we are lucky, we might get to catch up with Haile Gebrselassie…. Today we have been to Debre Zeit to see the school well which Tutu Melaku has funded – the locals have dug a 30 metre hole and they think that they will need to keep digging for another 3-4 metres before they find water. This will save a lot of time and effort and mean that the school children won’t have to carry water such a long way. A fantastic project. We have also visited the pioneering PFC Ethiopia training centre in Debre Zeit. The revenue generated from courses and projects there helps support people in disadvantaged children and families across Ethiopia. Mulugeta Gebru, who is Executive Director of JeCCDo, PFC Ethiopia’s sister organisation, explained to us that one of the charity’s main goals is to empower local communities and bring about sustainable development. If you are travelling to Ethiopia and would like to stay at the Debre Zeit centre, do get in touch with JeCCDo: jeccdo@gmail.com. I am going to have to finish here. It has taken me 3 hours to write this because the internet keeps crashing and it is getting late. Good night….. It is now 20 months since I last visited Ethiopia, and so much has been happening on the Gende Tesfa School and community front. Together with Holy Trinity School, the Social Action Committee and other friends in Cookham, we have raised a staggering £12, 662.04 for our Ethiopian friends in Gende Tesfa. Fundraising events have included a#Leap4Africa event at Longridge, a triathlon, a duathlon, a Swim Disco at the Magnet in Maidenhead, the Holy Trinity School Ball and a Big Band Night. A big thank-you to everyone who has supported Partners For Change Ethiopia. Together we are changing lives. We have built a sports ground, funded the Breakfast Club and constructed water-points. But there is still so much more to do….. 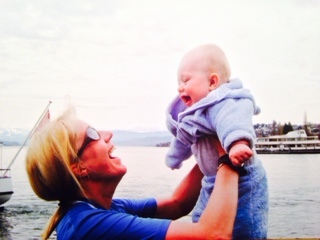 I am a journalist, mother and marathon fun runner and I have just started training for the London Marathon (my 14th!). I am following a programme by running coach, Paddy McGrath from Cookham Running Club and also doing some gym-work at the Crowne Plaza in Marlow. If I can run 26.2 miles, anyone can! I hope that this blog will inspire women of all ages to take up a sporting challenge. Do also follow #thisgirlcan. And if the going gets tough, one thought will carry me through the next 3 months. I am raising money for Partners For Change Ethiopia, a very special charity which has been changing the lives of children in impoverished communities in Ethiopia for more than 30 years: http://www.pfcethiopia.org.